The National Geographic documentary “Free Solo” opens Friday, Nov. 2, at the Martha’s Vineyard Film Center. Prepared to be terrified by this box-office record breaker, even if you’re an extreme sports fan. The subject is Alex Honnold, the free solo climber who last year became the first to reach the 3,200-foot summit of El Capitan in California’s Yosemite National Park. The terror is worth enduring, because 33-year-old Honnold proves a lot more interesting and believable than his superhero equivalent, Spiderman. Even though the outcome is obvious from the start, watching this free soloist achieve his death-defying dream will grip the viewer. For the unfamiliar, free soloing refers to rock climbing without ropes or any other form of safety gear. It rates as perhaps the riskiest of extreme sports, a category that includes surfing, skiing, parachuting and sailing — each of the extreme variety. Filmmaker Jimmy Chin, who made the documentary with his wife Elizabeth Chai Vasarhelyi, is both Honnold’s friend and a climber himself. “Free Solo” follows the couple’s 2015 Sundance winner, “Meru,” a climbing documentary set in the Himalayas. While there’s no rational explanation for why Honnold free solos, the filmmakers do explore what makes the man tick. Born in Sacramento, he started climbing at age 5, and by the time he was a teenager was competing in championships. In his memoir, “Alone on the Wall,” he claims he never felt he had a natural gift for the sport. In the film, he talks about how, growing up in an undemonstrative family, he had to learn how to hug. Dropping out of Berkeley after a year, he lived in a van and became a vegetarian. When Honnold’s girlfriend, Sanni McCandless, enters the scene, she provides a perspective on what it’s like to commit to a man who chooses to risk instant death. She helps flesh out the picture of Honnold as a solitary, repressed individual. When he falls for the first time while practicing the ascent, he ends up with compression fractures of the spine because McCandless accidentally lets the safety rope slip out of her hands. In a second fall, he sprains an ankle, and his climbing friend Caldwell speculates how a romantic relationship may interfere with a climber’s concentration. “Free Solo” follows Honnold’s meticulous preparations for his record-breaking climb. He repeatedly practices the route he’ll take, making notes in a journal. The filmmakers mark the route up El Capitan, explaining the challenges of different parts, like the Freerider Route or the Boulder Problem section, which requires a karate kick. The soundtrack records Honnold’s breathing as he ascends, a compelling reminder of the physical effort involved. The film shows how his fellow climbers, including Chin, fearfully recognize the possibility that Honnold will fall to his death at any minute. He doesn’t. Instead he completes the ascent in three hours and 56 minutes. As the film ends, he claims he doesn’t know what will come next. But in June of this year, he and Caldwell, climbing together, beat the speed record for the 3,000-foot El Capitan Nose by climbing it in under two hours. 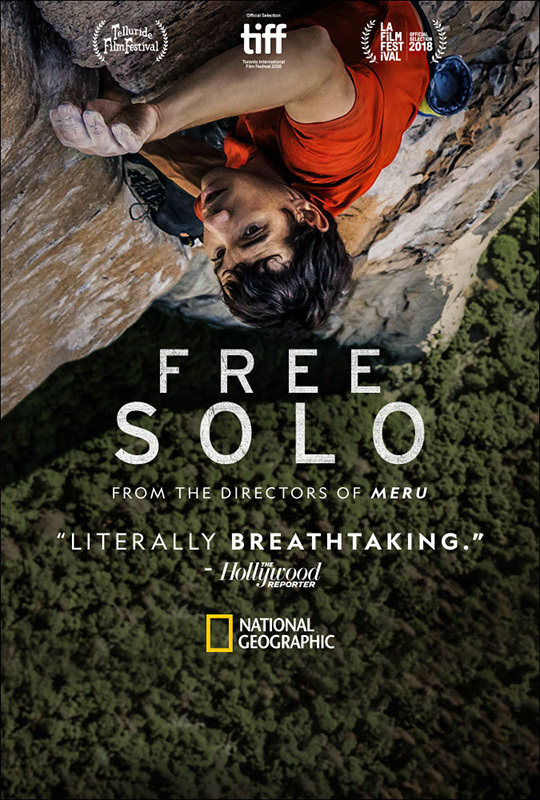 Information and tickets for “Free Solo” and other films at the Film Center and the Capawock are available at mvfilmsociety.com. The Strand is closed for the season.